The name “amethyst” derives from the Greek amethystos, which means “a remedy against drunkenness”, a benefit long ascribed to the purple birthstone. Because of its wine-like colour, early Greek mythology associated the gem with Bacchus, the god of wine. Amethyst was also believed to keep the wearer clear headed and quick witted in battle and business affairs. Renaissance Europeans thought it calmed lovers overrun by passion. Amethyst is the gem traditionally given for the sixth wedding anniversary. Wear it in celebration of your wedding nuptials or as your February birthstone and you’ll be in royal company: Catherine the Great (Empress Catherine II of Russia, 1729–1796) had a penchant for the gem and decked herself in amethyst necklaces, earrings and other ornaments. 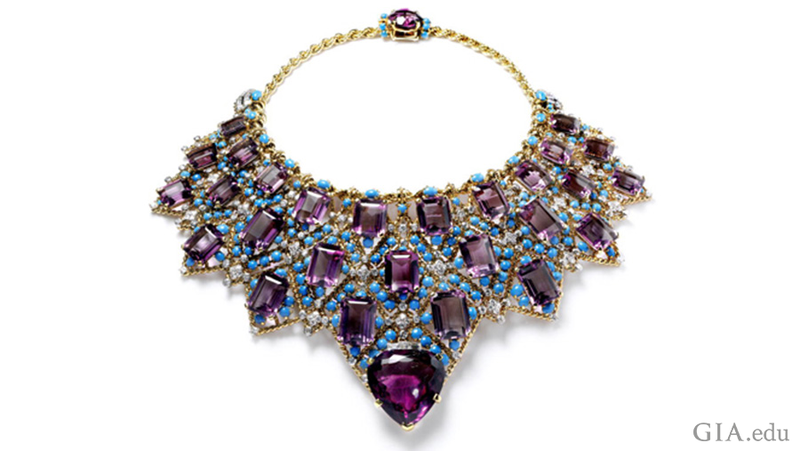 The famous jewellery connoisseur Wallis, Duchess of Windsor (1896–1986), made a memorable statement when she wore a lavish Cartier-designed amethyst bib necklace to a gala in Versailles in 1953. Historically, royals have admired the deep purple hue of the February birthstone since at least the days of Alexander the Great. Amethyst lore also includes several claims to mystical powers, including that it would convey strength and wit to those who wore it. If you celebrate a February birthday, wearing an amethyst can be a symbol of personal empowerment and inner strength. Russia was the major source of amethyst until the 19th century, when large deposits were found in Brazil. Once as rare as ruby or emerald, amethyst was suddenly in abundance. Today, the most important sources of amethyst are in Africa and South America. Brazil is still a major supplier, especially its southernmost state, Rio Grande do Sul, although the rough amethyst mined there tends to have a lighter colour than amethyst found in other countries. Amethyst from Brazil sometimes forms in hollow, crystal-lined geodes so large you can stand in them. 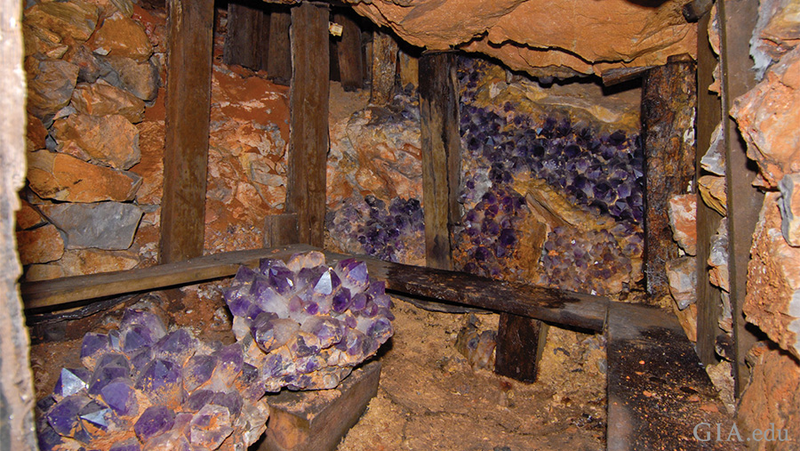 The Anahí mine in Bolivia is another prominent source for amethyst. Hidden in the Pantanal wetlands, the Anahí mine is shrouded in fascinating lore. It was discovered by a Spanish conquistador in the 1600s, given to him as dowry when he married Anahí (a princess from the Ayoreo tribe), forgotten for three centuries, and rediscovered in the 1960s. The Anahí mine is also famous in gem circles as the source of the unusual bicoloured amethyst-citrine crystals called ametrine. In Africa, Zambia’s Kariba mine is one of the largest amethyst producers in the world. Amethyst mined there tends to be of superb quality with richly saturated colours. Amethyst is also found in the United States, just 46 miles (74 km) outside of Phoenix, Arizona. 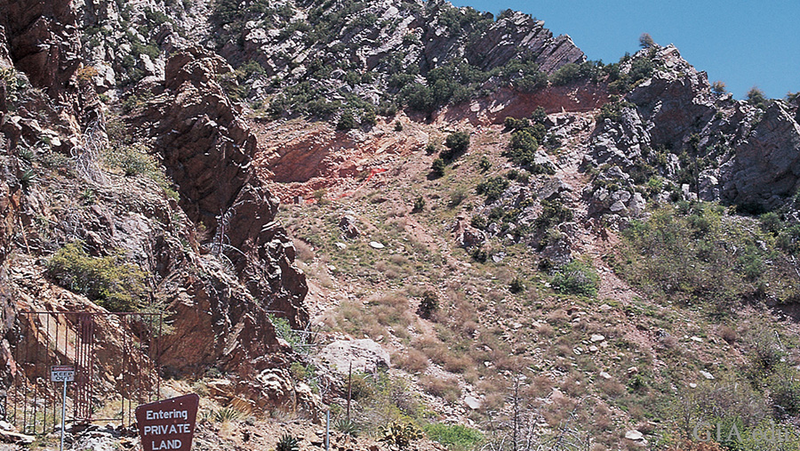 The Four Peaks amethyst mine is located high in the most rugged part of the Mazatzal Mountains. A remote location, hot summer temperatures, and a lack of water and power at the mine make for challenging conditions. Yet this jagged, arid, rattlesnake-infested terrain produces some very fine dark purple and purplish red amethyst crystals. Heat treatment is the most common technique for improving the colour and marketability of natural amethyst. Heat treatment can’t make pale amethyst darker, but it can lighten the colour of very dark amethyst and make it more attractive. It can also remove unwanted brownish inclusions in some amethysts. Some amethyst turns yellow – to citrine – with heat treatment. Heat treating amethyst results in a permanent change in colour. However, submitting it to intense heat may render it slightly more brittle than usual, and care must be taken not to damage pointed faceted corners and sharp edges. Note, too, that excessive heat can remove the colour entirely, and some amethyst fades with prolonged exposure to strong light. Though the colour is stable with normal use, this is not a birthstone to wear to the beach every day. Amethyst birthstone jewellery can be cleaned with an ultrasonic cleaner, but steam cleaning is not recommended. A soft brush with mild soap is the safest option. As you shop for the February birthstone, you’ll also encounter lab-created amethyst. Having the same chemical and physical properties as its natural counterpart, synthetic amethyst has been known since the 1970s. In some cases, it is very difficult to distinguish natural from synthetic amethyst without access to advanced gemmological testing. The GIA Laboratory can tell the difference, but many in the jewellery industry do not request testing because of the cost and time required to determine the origin of what is a comparatively inexpensive gem. Still, merchants are required to tell you if a gem is natural or synthetic. Amethyst has enchanted kings and queens for many centuries. Now you know how to buy a royal gift for your love with a February birthday. And for some quick tips, take along our Amethyst Buyer's Guide the next time you go shopping.